MSNBC anchor Ari Melber threw to Welker, who didn’t hear him. Unaware that she was live, Welker proceeded to tell Palmieri exactly what she could expect. Melber: We go right to Kristin Welker. Kristen, go ahead. Welker, unaware she was live, speaking to Palmieri: Okay. Okay. And I’m going to ask you about Flint. Melber, trying to warn Welker: Kristen, go ahead. You’re live. 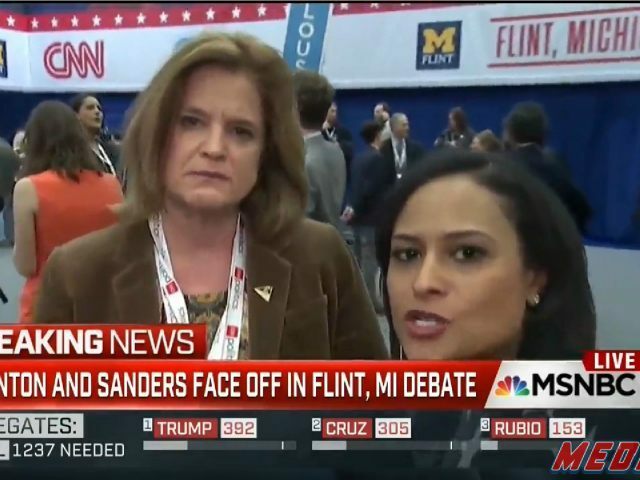 Kristen Welker, in the spin room, I believe she has the Clinton communications director with her. Go ahead, Kristen. Welker, still unaware she was live, to Palmieri: Okay, thank you. I think this is his last question. Melber, still covering: You know, we have Kristen Welker, we’re looking at her, she couldn’t quite hear me before. Can you hear me now? If you can, go ahead. Welker, finally aware she was live: Hey, Ari, I’m here with communications director Jen Palmieri for the Clinton campaign. Welker, interrupting: Ari, I can hear you. I’m here with Communications Director Jen Palmieri. Can you guys hear me back in the studio? Melber: Yes. We’re on a delay, but go ahead. Welker: Can you guys hear what we’re saying here? Welker: Okay. Here with Communications Director Jen Palmieri. Jen, thank you again. What was your general reaction? It was a very fiery debate. Palmieri: It was fiery, but it was also very substanitive [sic].